Giorgio Grassi is one of the most important modern architect in Italy and he is a member of the Italian rationalist school. 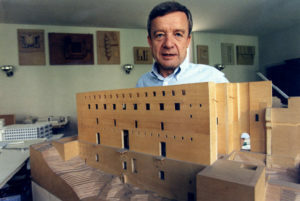 He has designed numerous schools, museums and libraries especially in Northern Italy. He was born in 1935 in Milan. 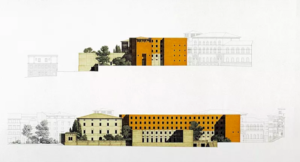 After studying architecture at the Politecnico di Milano university, he worked for the magazine Casabella-Continuità. Since 1965, he worked as Professor in the schools of architecture of Milan and other universities. Grassi emphasizes the rationalism of his compositions, sharp edges, bucket, simple forms, no doubt with many influences from the great French master Le Corbusier. 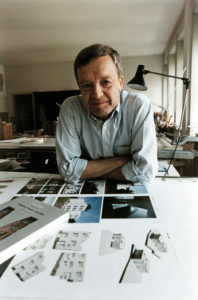 During his life, he published several books and he has won prizes in numerous competitions such as school complex (Bologna, 1964), residential unit at Lützowplatz (Berlin, 1981). 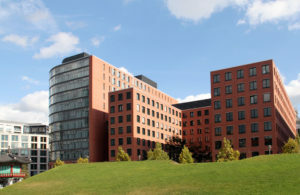 The overall project follows the urban design drawn up by Grassi. The aim was the architectural transposition of the results of the Potsdamer Platz competition and the application of the “Berlin Mischung” concept through the coexistence of the residential, commercial and production functions. 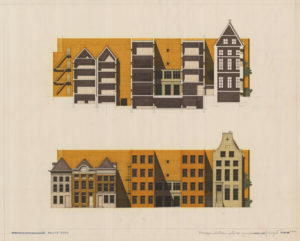 Grassi set out to “rebuild a piece of the historic city” with a composition of great architectural quality. The complex consists of five building units, of which the central ones adopt the building type to H. As in the bourgeois palaces of the past, the main facades open onto the “urban” street with shallow courtyards, lobbies, arcades, passages and cafes. The formal unity of the whole is guaranteed by the uniform height of the eaves, by the brick walls in the face, by the yellow sandstone slabs and, in particular, by the facades with rectangular openings arranged according to a rigorous geometric pattern. In the executive phase, three of the five building blocks were assigned to other architectural firms. The project is characterized by few important building blocks of the ancient city. A way of building the city closely linked to the place: an element of mediation between the city and the countryside, a determining part of the landscape. And that gives rise to a tight and linear building that, on the one hand, closes to complete the curtain of the city street and, on the other, opens to understanding the countryside and so decisively participates in the architectural definition of the external front of the city. A decisive alignment: the free and straight line that, tangential to the front of the Ciacci palace garden, unites the church of Santo Stefano to that of the district of Drago, a line that runs parallel to the old road of the road of the San Domenico gardens before this changes direction. These are the starting conditions of the project. And then the other figure, where the city looks at itself and sees itself as a “scene“, which has its privileged point of view at the end of the Lizza, in front of the church of Santo Stefano. Grassi believed that architecture should work separately from political, economic, social and technological events. Although it is described as very rational, his architecture embodies a sensibility to both classical and neo-classical architecture but it is also influenced by the modern movement. His formal work is characterized by clarity, honesty and simplicity without ingratiation, rhetoric, or spectacular shape-making. One of Grassi’s most famous trademarks are his use of exposed brick and square windows in most of his buildings. In his writings, he refers to the German socialist architects of the 1920s and refers to buildings and public spaces to be used as guidelines. Grassi is a non-conformist and a critic of conventional mainstream architecture.